The engine is fresh water cooled via a keel cooler. The current engine, an historic piece of equipment in its own right, was installed in 1992 after an extensive re-build / remanufacture. It runs at maximum 300 rpm. The engine has an air and manual clutch for shifting, forward neutral and reverse. This Atlas Imperial was built in 1940 and initially installed in a commercial fishing vessel which was conscripted during WWII for daily mail transportation in Alaska. This engine continues to provide safe and reliable propulsion and is ready to cruise. There are numerous spare engine parts including four new heads. The prop is a four blade 50" by 38"
The steering is either wheel or "jog stick" compressed air. The watermaker is a 600 gal per day system that feeds the 1,000 water tank. She has multiple electrical systems. The 32V DC is required for the radar, autopilot and emergency lighting for the engine room. The 12V DC is required for the diesel powered generator starter and the communication radios. The 120V AC is for the normal lighting, all wall heaters but one, head flush and domestic water supply. The 220V AC single phase is for the backup air compressor, engine room exhaust fan and the anchor windless. The main generator is 20KW Isuzu with both 32V and 12V alternator powered Isuzu diesel. There is also a 5KW 120V diesel generator for quieter periods when less power is required. This boat was constructed by shipwrights in Astoria, Oregon and launched in 1890. She was built as a steam vessel to carry passengers and freight between Astoria and Tillamook. She has had many conversions but has been in commercial service her entire life. Following a fire in 1922 she was re-built from the waterline up and the hull was lengthened to 78 feet. At that time the steam engine was removed and a three cylinder 110 hp engine was installed. She has been owned and operated as tug in continual service until 1982. The last major work was completed following a stormy accident caused by a "breakaway" vessel in 2010. The forward bulkhead and down to the waterline and forward to the stem had to be replaced or repaired. That work was done by Haven Boat Works in Port Townsend. You will find this boat clean and very well appointed. It is a most comfortable liveaboard and a ready long-distance traveler. Entering by way of the saloon deck house through the double dutch door you are in the large galley saloon. Appointed by a folding dining table with a settee, pantry, The starboard settee converts to double sleeping which provides sleeping for a total of eight. galley counters, sink and stove. The cook stove is a diesel flat top with oven. To starboard is a passageway to the head, shower, two forward cabins, the stairway to the pilot house and the stairway to the lower deck. The lower deck includes the spacious well-lighted engine room with access to the forward double double stateroom . The pilot house includes a large chart table with storage below, the helm and doors both port and starboard for access to the upper boat deck. The upper deck includes a crane for lifting the shore boat and controls for docking and a forward stairs to the lower deck. There are three anchors. One 500 lb. navy on a 5/8" 400 ft. all chair rode, a spare forward on the scuttle hatch and one on the aft of the wall of the main cabin. Air control for rudder and shifting from the pilot house or the upper boat deck. Compressed air is also used for engine start. Currently the radar is not functioning but seller will either repair or replace. This Tug Boat represents a significant piece of history in the development of the marine industry of the Pacific Northwest. She was initially built for commerce carrying passengers and freight between Astoria and Tillamook, Oregon. After roads were completed and water transport was no longer the only option this boat began providing transit of passengers and freight between Seattle and the Alaska gold fields. . Then followed a long career of general tug services from 1902 through 1982 until she was converted to a wonderful and unique live-aboard. This boat has recently completed trips to Alaska and a circumnavigation of Vancouver Island. There currently is 3,000 gal. of fuel on board and she is ready for another trip. She has been hauled and serviced every three years and show every sign of loving and continuous care. Of special note is that this boat still carries her status as a commercial vessel. 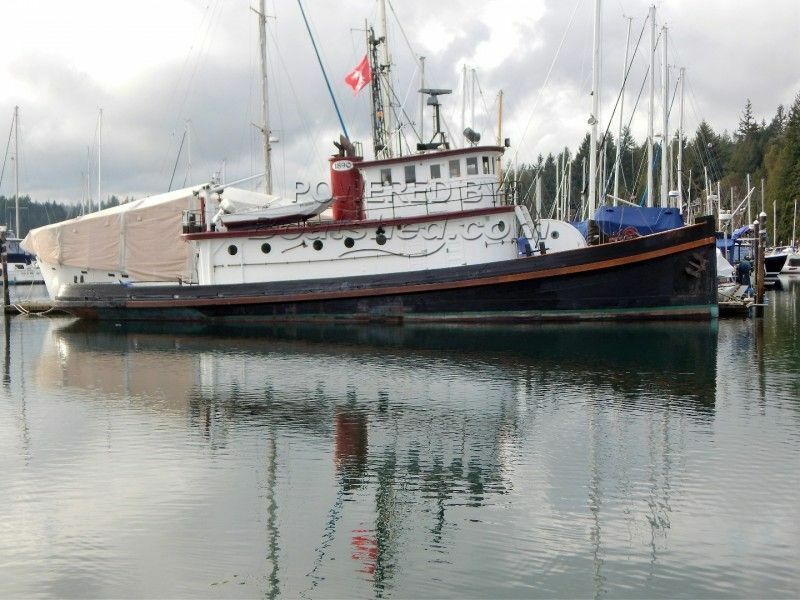 This Converted Tug Historic 78 Foot Workboat Liveaboard / Yacht Conversion has been personally photographed and viewed by David Carleson CPYB of Boatshed Seattle. Click here for contact details.